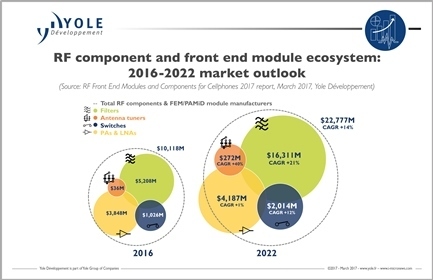 Claire Troadec from market researcher Yole Développement forecasts the RF front end modules and components market for cellphones to grow from US$10.1 billion in 2016 to U$22.7 billion in year 2022. The forecast is based on the expected grwoth in upcoming 5G communication technology. “Filters represent the biggest business in the RF front end industry, and the value of this business will more than triple from 2016 to 2022”, announces Claire Troadec from Yole. THe growth is due to the requirement of additional filtering needs from new antennas as well as the need for more filtering functionality due to multiple Carrier Aggregation. Yole says Power amplifiers (PA) and Low Noise Amplifiers (LNAs), the second biggest RF FE business, will be almost flat over the same period. High-end LTE PA market growth will be balanced by a shrinking 2G/3G market. However LNA market is predicted to grow steadily, where Yole gives the reason of addition of new antennas for the growth. The third biggest acccording to Yole is Switches whose business to double driven by antenna switches. The antenna tuners, estimated by Yole to be worth US$36 million market value now is predicted to expand 7.5x more to reach US$272 million in 2022. The growth is attributed to the tuning being added to both the main and the diversity antennas.